This is sponsored post on behalf of Michaels. As always, all opinions and ideas are 100% my own. We love our Elf on the Shelf that comes to visit every year! In the past, I've arranged the elf to be doing funny (not naughty) things around the house and love watching my daughter's reaction when she wakes up to see what he's up to each day. This year, I'm planning on doing something a little different. Each morning, the elf will be in a different place, but will be holding a clue to find a small, simple gift each day, counting down to Christmas day!! 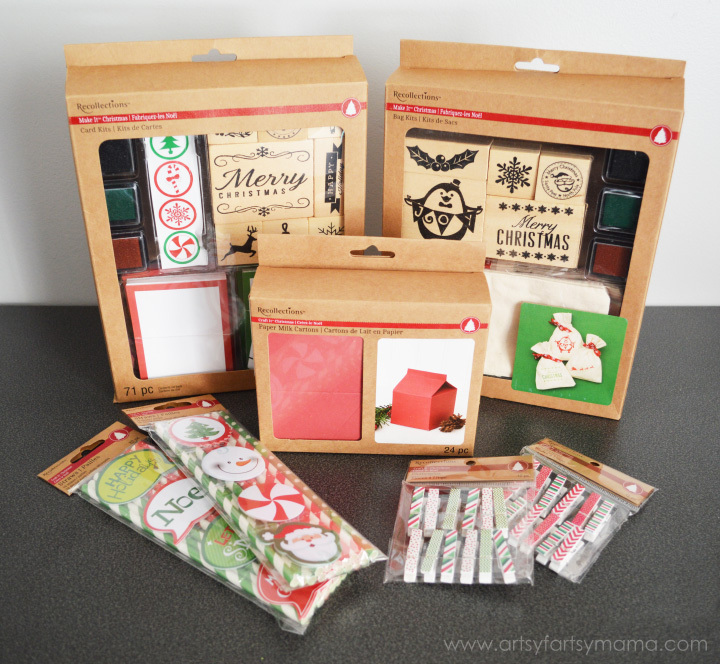 All the supplies are Recollections Holiday products. They are found at Michaels, in the paper crafting section (on the aisle end-caps). There are so many products to choose from, including kits and all kinds of embellishments. The paper milk cartons were the first thing that caught my eye. 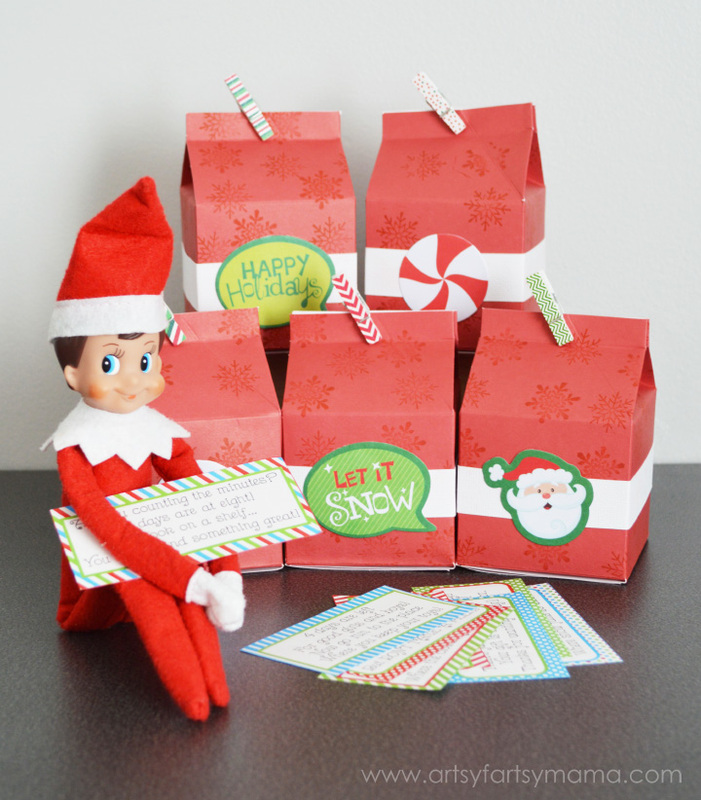 There are 24 in each package, so I immediately knew they would make perfect elf gift boxes. 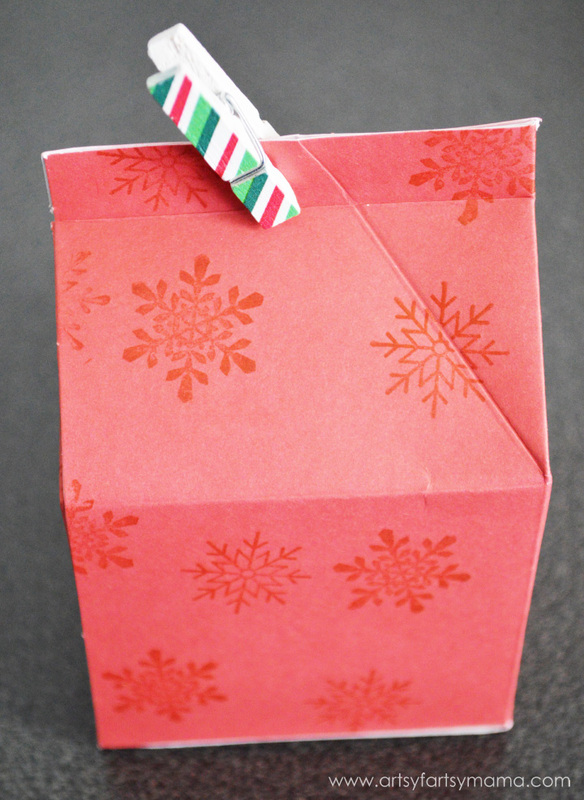 I also purchased bag and card kits, straws with tags, and clothespins to embellish the cartons. Tip: Even though all the products are already at great prices, I highly recommend watching for sales and use coupons to save even more! 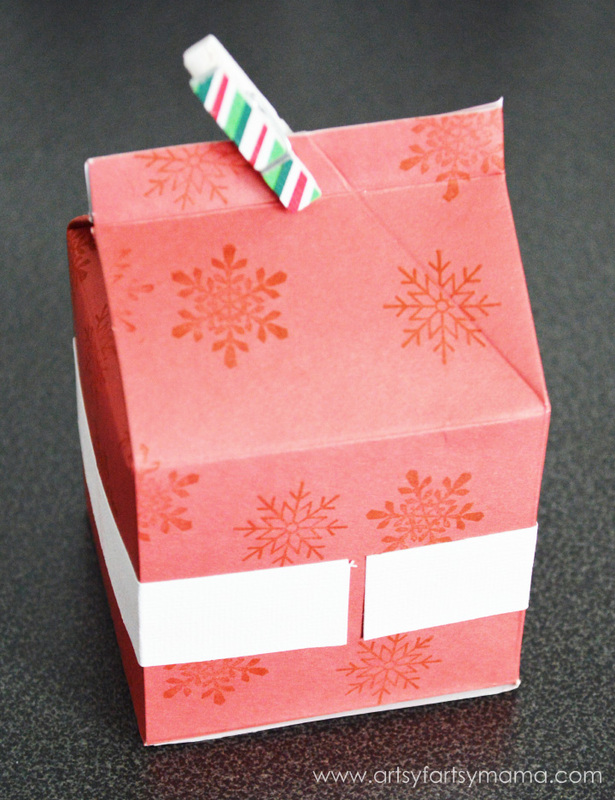 The paper milk cartons come unassembled, which makes them much easier to embellish! 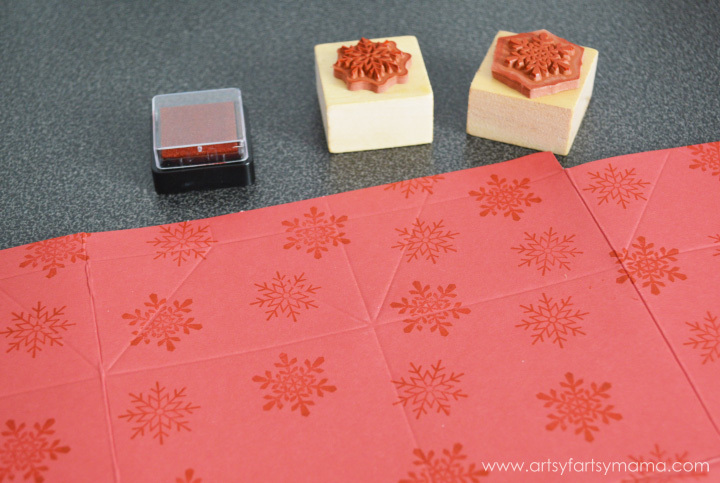 I started by taking snowflake stamps and red ink pads from the bag and card kits and laying out the cartons. Stamp all over the paper using both stamps. I love how the red ink looks on top of the red paper! You can stamp and assemble the cartons as you go, but I found it much easier to stamp all the boxes first, then assemble next. 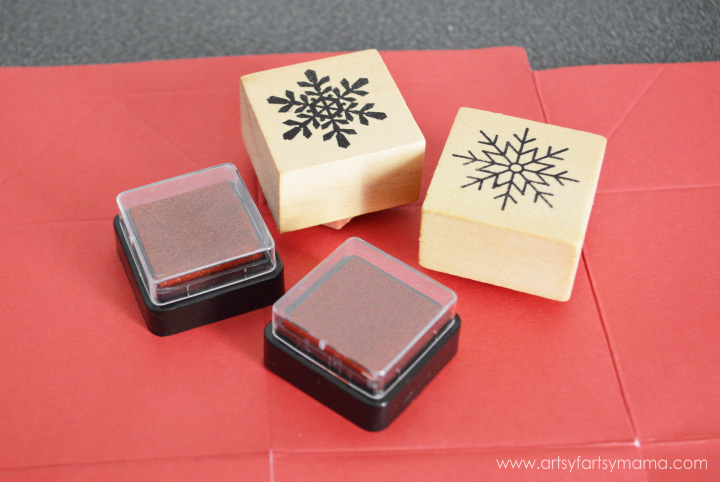 It also gives the ink some time to dry so you'll be less likely to smear the stamps and get ink all over your hands. There are instructions on the packaging to fold the boxes. They were surprisingly easy, and it helps that there are already sticky tabs on the box so you can peel and stick as you go! One half of the carton top stays open and the other has a sticky tab to keep it together. Since I haven't filled mine yet, I'm keeping them closed with the cute, coordinating holiday clothespins! Next, I cut a one inch strip from a 12x12 sheet of adhesive-backed cardstock. Regular cardstock would also work great, but I must admit that using the adhesive-backed cardstock makes things a little easier. It sticks easily and you don't have to get the glue out! As you can see, the carton measures just a little over 12 inches, so the paper ends don't meet exactly. I fixed the problem by sticking one end near the center of the "front", and carefully wrapping it around the carton and getting the other end as close as possible. To cover the gap, I used one of the stickers from the package of straws! 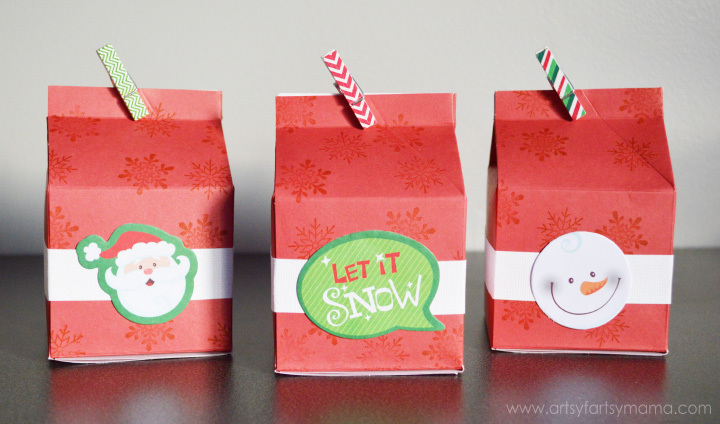 The labels have a strip of adhesive, so just peel off the backing and stick it on the carton! Super easy and it looks adorable. Repeat until you have all 24 cartons put together. Now you can fill them with whatever you like! I think we're going to put in some treats, and maybe throw a piece of paper in a few cartons with some kind of Christmas activity so it gives my daughter something different to do to get excited about Christmas than just eat candy. For this to work, you'll need to print out the Elf on the Shelf Printable Advent Clues so that your elf (or whatever you choose to use) can hold the clue each morning. There are ten cards that specifically count down to Christmas day, but the other 14 cards can be mixed up to be used any day you want. They all say where to hide the gift, so that makes your job MUCH easier!! Don't do Elf on the Shelf? You can still do this activity with your kids as a fun way to count down to the big day and add things in the boxes to celebrate however works for you!! *If you post this on the internet, credit must be given to Artsy-Fartsy Mama & linked back to my site. 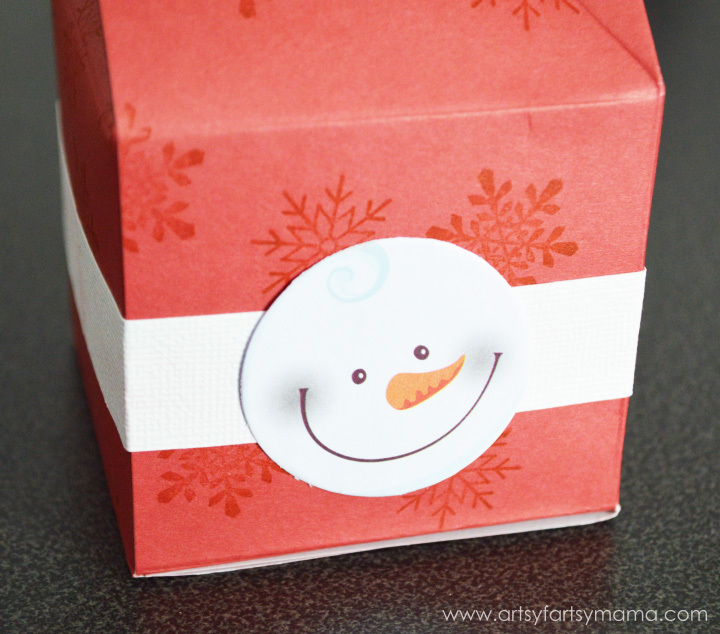 I LOVE how you stamped the boxes...it really added a beautiful dimension! CUTE! Okay I do not like Elf on the Shelf, but I remember YOUR elf on IG, and I'm looking forward to his hijinks this year! This is a fun twist! What a great to count down the days! So crafty!